The term Cavalier was first used by Roundheads as a term of abuse for the wealthier Royalist supporters of King Charles I and his son Charles II of England during the English Civil War, the Interregnum, and the Restoration. It was later adopted by the Royalists themselves. Although it referred originally to political and social attitudes and behaviour, of which clothing was a very small part, it has subsequently become strongly identified with the fashionable clothing of the court at the time. Prince Rupert, commander of much of Charles I's cavalry, is often considered to be an archetypal Cavalier. Ormonde's troops left Dublin on 2 April and marched on unopposed from Naas to Athy (5 April) and on to Maryborough (now Portlaoise; 8 April), re-supplying the royalist garrisons and sending cavalry forces to support those at Carlow and Birr, before returning to Athy on 13 April. Setting out at 6am on the 15th, and having decided to avoid a battle on their return march to Dublin, the government troops were blocked by Mountgarret’s rebel militias at Kilrush, 2 miles south of Suncroft, between Kilcullen and Moone in south-eastern County Kildare. Though outnumbered, Ormonde managed to defeat the rebels and marched on to Dublin by 17 April. Naas is the county town of County Kildare in Ireland. In 2016, it had a population of 21,393, making it the second largest town in County Kildare after Newbridge. Athy is a market town at the meeting of the River Barrow and the Grand Canal in south-west County Kildare, Ireland, 72 kilometres southwest of Dublin. A population of 9,677 makes it the sixth largest town in Kildare and the 50th largest in the Republic of Ireland, with a growth rate of approximately 60% since the 2002 census. Baron Dunboyne was a title first held by the Petit family some time after the Norman invasion of Ireland. Thomas or John Carte was an English historian. ↑ Carte, op cit., p.250 ff. The Irish Confederate Wars, also called the Eleven Years' War, took place in Ireland between 1641 and 1653. It was the Irish theatre of the Wars of the Three Kingdoms – a series of civil wars in the kingdoms of Ireland, England and Scotland. 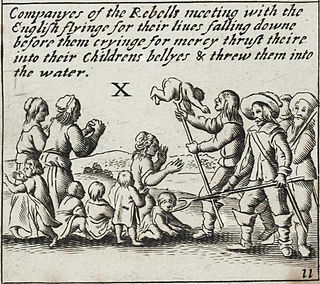 The war in Ireland began with a rebellion in 1641 by Irish Catholics, who tried to seize control of the English administration in Ireland to force concessions for Catholics. This developed into an ethnic conflict between Gaelic Irish and old English Catholics on one side, and English and Scottish Protestant colonists on the other. Catholic leaders formed the Irish Catholic Confederation in 1642, which controlled most of Ireland and was loosely aligned with the Royalists. The Confederates and Royalists fought against the English Parliamentarians and Scottish Covenanters. In 1649, a Parliamentarian army led by Oliver Cromwell invaded Ireland and by 1653 had conquered the island. Nicholas French, Roman Catholic Bishop of Ferns, was an Irish political activist and pamphleteer, who was born at Wexford. County Kildare in the province of Leinster, Ireland, was first defined as a diocese in 1111, shired in 1297 and assumed its present borders in 1836. Its location in the Liffey basin on the main routes from Dublin to the south and west meant it was a valuable possession and important theatre of events throughout Irish history. 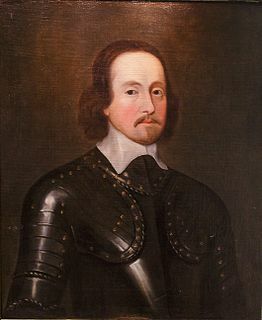 Rory O'Moore, also spelled Roger O'Moore or O'More or Sir Roger Moore, was an Irish landowner of ancient lineage, and is most notable for being one of the four principal organizers of the Irish Rebellion of 1641. Events from the year 1642 in Ireland. Calverstown is a small village in County Kildare, Ireland. It lies 6 km (3.7 mi) south of the town of Kilcullen and about 16 km (9.9 mi) from each of the towns of Athy, Kildare, Naas and Newbridge. It is an old settlement located close to the archaeological sites of Dún Ailinne and Old Kilcullen. The village has a stream running through it with another to the south. In the 2006 Census it had a population of 650. Richard Butler, 3rd Viscount Mountgarret (1578–1651) was the son of Edmund Butler, 2nd Viscount Mountgarret and Grany or Grizzel, daughter of Barnaby Fitzpatrick, 1st Baron Upper Ossory. He is best known for his participation in the Irish Confederate Wars on behalf of the Irish Confederate Catholics. The Battle of Ballinvegga or Battle of New Ross was a battle of the Irish Confederate Wars fought on 18 March 1643. The first Siege of Drogheda took place in 1641-42, during the Irish Rebellion of 1641. A Catholic force under Féilim Ó Néill laid siege to the town and assaulted it twice but failed to take it. The siege was broken by English troops sent from Dublin. Sir Thomas Lucas of Lexden, Essex, England, along with his younger brothers, Sir John Lucas (d.1671), and Sir Charles Lucas (d.1648), distinguished himself as an officer fighting for the royalist cause in the Civil War. Sir Charles Coote, 1st Baronet was an English soldier, administrator and landowner who lived in Ireland.